My clients mean the world to me and throughout the years I have crafted photography sessions like no other, ensuring I deliver unforgettable memories that you, your family and your friends can treasure forever. If you would like a full service experience, where you are pampered for the day with professional hair and makeup services; be sure to ask about the full Glamour or Boudoir sessions. It is a day you get to experience what it is like to be a runway model for the day. Premium retouching services is included. So contact me today and let's get that photography session booked that you have been holding off on doing. It's now more affordable with payment plans. What to Expect Before the Session? Do you like candid or formal shots? What is your style, what should you wear, and what location will best reflect your personality and vision? Once we have established how to achieve your vision, and where, the next step is to choose the right session package to fit your needs. Do you like the option of many outfit changes and locations, or just a few is all that is required. Lastly, we just need a date, and then we'll book a session. What is a typical process? We briefly discuss your vision of how you or a subject is to be photographed and where. We also discuss the extent of retouching your images in Photoshop. Schedule a session and location for the shoot and discuss package options that best fits your needs. You don't need to decide on which package you want until you see your images. If you request the full service glamour/boudoir shoot, then we have a consultation on what to bring, what to wear, and how you would like your hair and makeup. A deposit is required for the hair and makeup artist. Show up ready for an amazing shoot at the location discussed. 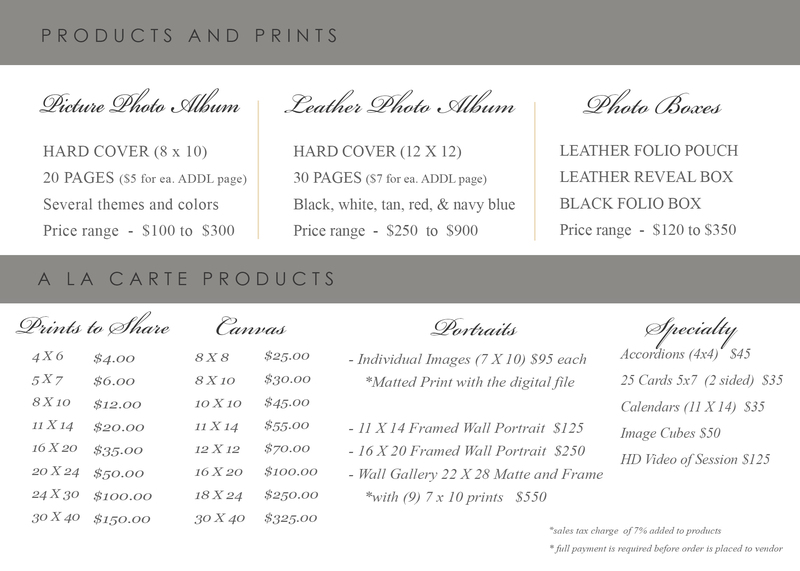 Schedule a time for viewing your printed images in the studio about 2 weeks after the shoot. Viewing or reveal of the printed photographs at the studio. Purchase only the ones you absolutely love, and the package applies closest to the number of images you purchase. For example, if you only want 10 images out of 25...then collection one is what you would pay for....you don't have to purchase the ones you don't like. This applies to tier one and tier two pricing. Areas of service include the greater metropolitan Tampa, Brandon, Clearwater and St. Petersburg, Lakeland area. Tier one pricing is for basic photography services, and Tier two pricing is for those who want to experience a full service session, with a wardrobe consultation and hair and makeup services. Cancel or change your appointments if necessary with a call 48 hours in advance. ​Click on the policy and contract link for more information. A sitting fee is due at the time of the session and is applied towards the package you choose. The balance is due the day you receive your images. Ask about the installment payment plans interest free. What is the best way to comunicate? Cancel or change your appointment if necessary 48 hours in advance by calling please. Saturday and Sunday appointments are available with adequate notice. ​These days generally book up first.